It’s a tiny phone that’s super-easy to carry around! Everyone says size doesn’t matter… but it really does. Fortunately, bigger isn’t always better, and that’s proved (big time) by the world’s smallest phone, the Zanco t1 handset! 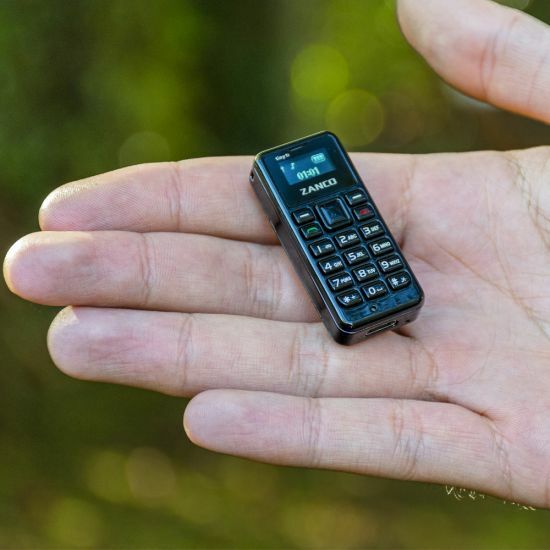 Why would you need the world’s smallest phone, you ask? Well, why wouldn’t you?! This phone is perfect for if you’re looking great and don’t want to ruin your outfit with a bulky phone in your pocket, or if you don’t have a lot of pocket space to begin with. It’s also excellent to keep as a backup phone, or just to have to show your tech awesomeness! Fully functional, this phone runs off a Nano SIM and uses flash memory to store up to 300 contacts, 50 text messages, and the last 50 calls coming in or going out. It charges via micro USB (and comes with a cable), making it really easy to keep juiced up! Being just over the size of a coin, and weighing less than one, this phone is an awesome accessory that’ll could prove a life-saver. Slip it into your jeans’ coin pocket on a night out, or into your super-tight gym clothes’ pockets so that you’re always in touch, without having your hands full! Zoolander is a style icon, and he likes himself a tiny phone… so you really can’t go wrong with the Zanco t1 – the world’s smallest phone! Buy yours today!